Why: We’ve said it at least 2 times before and we’ll probably say it again. For now however, we’ll be content saying it in the present: we award high points to novels with completely unique narratives. The setting for this novel takes place in Botswana and the proceedings that follow are all related to southern Africa living. The agency’s staff is unique, the clients are unique, and the cases are unique. Heck, even the cover art is unique. The woman who actually starts the detective agency, Mma Ramotswe, has a vibrant personality that resonates with the reader (this could be you). The No. 1 Ladies Detective Agency is anxious to take on any case, which often leads to some very interesting events. The cases range from not so simple mistaken identity; to work place dismemberment. Still, Mma Ramotswe’s practical problem solving skills are fully put to the test when she is asked to locate a missing eleven year old boy. Step aside Holmes and Spade, there’s a new sheriff in town! Throughout The No. 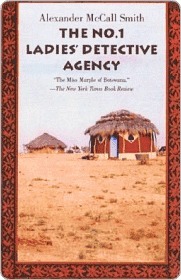 1 Ladies Detective Agency, the reader is given a delightful glimpse into the culture and traditions of Botswana. Still, it is the characters that make this novel special. Mma Ramotswe is larger than life in every sense of the word. And then there’s Mr. Matekoni, who is easily the most likeable automobile mechanic in all of literature. As to whether or not you’ll enjoy this one; there is no mystery! Editor’s Note: We’re extremely excited to be reading Tears of the Giraffe in the 2011 2nd challenge. Oh, I agree with you. The first few books in this series are utterly charming! Mma Ramotswe--I either want to know a life more like hers, or I want her for a best friend. I've always wanted to read this series and I actually had it in my hand the other day. Great review!